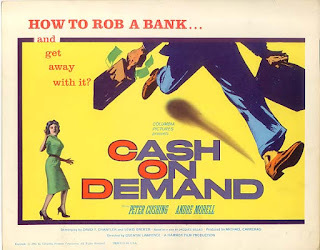 A couple nights ago I saw Cash on Demand (COD) from a recent boxset I acquired of Hammer films with crime themes. The options in the disc menu offered a choice between UK Theatrical Cut (66 min) and Extended US Cut (81 min). I opted for the former, since I assumed "Extended" meant previously edited footage was tacked on to make it feature length in the US. It was later that I realized that the UK release was delayed by nearly 2 years and additional cuts made to fit COD in a double bill because Hammer were not convinced of its saleability as a standalone. That said the film I saw did not seem noticeably abrupt or truncated, so at least they did a good job with the scissors. COD, which was adapted from a TV play called The Gold Within, is entirely set within the confines of a bank. The manager Fordyce (Peter Cushing) is a high-strung petty tyrant who delights in cracking the whip on his staff, idolizing machine-like efficiency and sneering at human niceties like the upcoming office Christmas party. 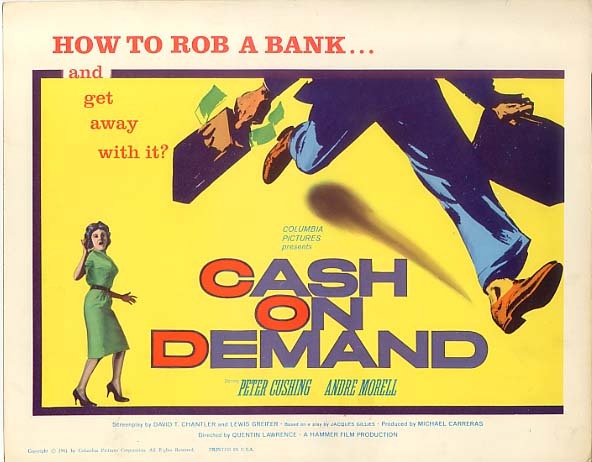 Fordyce suddenly finds himself in a servile position when he is visited by a Col. Hepburn (Andrew Morell) who poses as an insurance company inspector but turns out to be a robber that threatens to do away with Fordyce's wife and child if he doesn't follow a detailed series of instructions to help with emptying the vault funds. The cat-and-mouse play between Fordyce and Hepburn is the engine that powers the major part of the film, and it's beautiful. Peter Cushing, usually the badass in Hammer productions, transforms across the course of the film from unpleasant bully to spineless sniveler, and the consummate actor goes at it enthusiastically. Morell, who I have previously seen only in good guy parts in Hound of the Baskervilles and Plague of the Zombies, seems to enjoy his character's sinister humor and delivers his lines with palpable relish. Apart from these two stalwarts, a strong supporting cast of British actors lends much by way of credibility and immersion factor. I also laud Quentin Lawrence's direction, which deftly handles the intimate setting (Bernard Robinson's production design making the most of a measly 37,000 pound total budget) and keeps tight rein on the pace. In fact once Morell enters the film, the script moves in real-time without obnoxiously drawing attention to the fact. The end brings to mind Charles Dickens' story of A Christmas Carol. I will at some time take a look at the longer US cut (Clips from the 'making of' included on the disc suggest more scenes of Cushing being nasty to his staff), but the UK version was in itself cracking good entertainment. The video presentation on Powerhouse/Indicator's blu-ray is beautifully replicates the film's classy B&W photography, with healthy contrast and texture. The mono audio is clear and free of distortion. For extras there are a feature audio commentary, a nearly 20-min making of hosted by film historian Marcus Hearn, shorter pieces involving actor Lois Dane (who was 20 at the time of making this film, and later played a more sinister part in Hammer's Captain Kronos) and high-resolution scans of stills and a publicity booklet filled with profiles of the cast and anecdotes from the shoot (the printed booklet in the package also contains this material in addition to a fine essay by Kim Newman). My first viewing from this boxset was quite auspicious (of course I had the highest expectations of this, being a Peter Cushing fan), and I am eager to sample the other films soon.